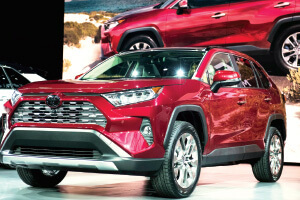 Although this will come as no surprise to industry insiders, after dozens of debuts at this year’s New York Auto Show, small luxury sport utility vehicles (SUVs), especially hybrid ones, are the darlings of the bunch. Cadillac showed an all-new XT4; Maserati debuted a Trofeo version of its solid Levante; Lincoln flaunted an Aviator hybrid; Lexus introduced the UX; and Volvo showed a handsome XC40. All of them will compete against each other, in some form or another, in that increasingly important segment. That’s not to say there wasn’t pure flash as well. Genesis’ all-electric concept coupe, the Essentia, came complete with butterfly doors, while Porsche’s 911 GT3 RS showed off in speedy green. And Mercedes-Benz showed its heavy hitter, an AMG version of its iconic G-Class wagon. 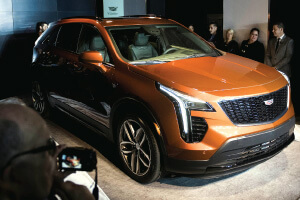 The Cadillac XT4 was unveiled during an event last Tuesday in New York. The XT4 has a lot resting on its pretty shoulders as General Motors (GM) tries to bring Cadillac back into the upper echelon of luxury. Targeted directly at valuable affluent and young consumers, the XT4 must prove to be just as good as Germany’s best small SUVs, such as the Audi Q3, BMW X3, Jaguar F-Pace, and bestselling Porsche Macan. It sits in the Cadillac line under the XT5, with a brand-new platform, unique grille and front fascia, and seating for five. The updated version of Mercedes-Benz’s excellent AMG C63 sedan has a 4.0-litre turbocharged V8 engine that gets up to 503 horsepower (hp). Inside, it has all the progressive technology options Mercedes makes, including a 10.25-inch (26.03cm) infotainment screen with smartphone integration, or an optional 12.3-inch digital instrument cluster and high-tech, multifunction steering wheel. 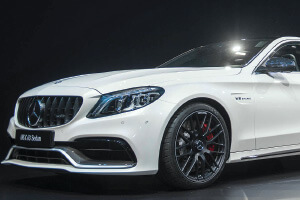 Of the three available body styles in the C63 line, the coupe (not shown) is fastest. It can get to 60 miles per hour (mph) in 3.8 seconds. The Audi TT RS received heavy updates and cosmetic refreshers for the 2019 model year. But as consumers continue to switch to SUVs, Audi’s brand-new Q8 and Q6 will be more important from an earnings-growth perspective. Audi also showed the RS5 Sportback coupe, which is meant to help it capture even more of the sport-sedan pie in the US. 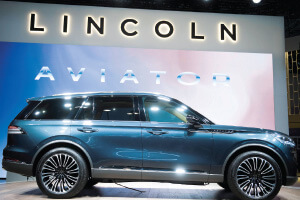 The Lincoln Aviator SUV is the latest in a series of new or updated SUVs from Ford’s premium vehicle line. With a design inspired by the downward slope of an airplane wing, it’s styled to woo moneyed millennials turned off by aggressively sculpted alternatives. (One attribute to attract said millennials is a function that can unlock the car from an iPhone.) The Aviator has three rows of seating and massive rims on a square frame that makes it look rather like a Range Rover. Lincoln showed this Aviator concept as a plug-in hybrid. Toyota took the wraps off its first top-to-bottom overhaul of the bestselling RAV4 crossover since 2013, with updates that include better aerodynamics and the ability to read road signs. In 2017, a long-in-the-tooth RAV4 managed to outsell every vehicle in the US, except for a few pickups. The new version is similar to previous generations, but has a slightly sportier design, better mileage on its hybrid system, and myriad trim options. 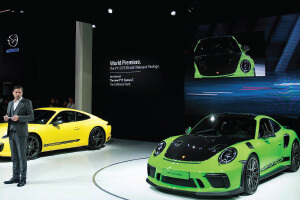 Klaus Zellmer, the president and chief executive officer of Porsche Cars North America, introduced the 2019 911 GT3 RS with the special Weissach Package. This has a 4.0-litre, flat-six engine that gets 520hp and 346 pound-feet of torque, improvements of 20 and seven respectively, over the regular GT3. It’s 0.1 second quicker to reach 60mph, too, with a sprint time of three seconds flat. The improvements cost more, as you might expect: The starting price is US$187,500 (RM725,625). 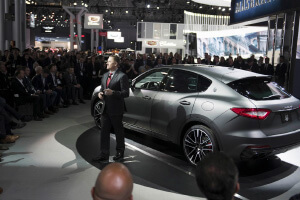 Tim Kuniskis, the head of Alfa Romeo for Fiat Chrysler, with the 2019 Maserati Levante Trofeo. The 590hp V8 joins the luxury SUV fray with a new hood that has dual vents, a carbon fibre splitter, full matrix light-emitting diode headlights, and 22-inch wheels on all-wheel drive. On the inside, it has seats of natural dyed leather lined with three-dimensional matte carbon-fibre weaving. It will be available later in 2018. The Volvo XC40 is the company’s third model in its excellent SUV line that’s designed to appeal to younger audiences seeking such things as big, 20-inch wheels, centre control console screen and capable all-wheel drive. It also comes with Volvo’s turbocharged, 2.0-litre, four-cylinder engine and eight-speed automatic gearbox. 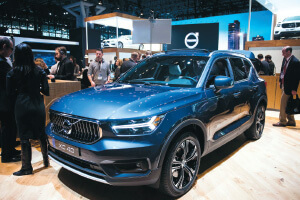 As for that big console screen, the XC40 offers a 12.3-inch digital instrument cluster and nine-inch, portrait-oriented touchscreen, with connectivity that includes Apple CarPlay and Android Auto as standard offerings. In recent years, Hyundai Motor Co’s Genesis brand has used the New York show to launch a string of concepts aimed at luxury competitors. This time around, the company revealed the Essentia, an all-electric coupe that is made from a super-lightweight, carbon-fibre monocoque body and sports a battery-powered motor that it says will get it to 60mph in three seconds.